Seriously. I have books on my floor, desk, and walls. I tiptoe around certain parts of my place. Walking on eggshells is easy; try twisting and turning around piles of books with the fear of a domino effect causing an avalanche of pages. Many writers identify as starving artists. You don’t make money as a poet. 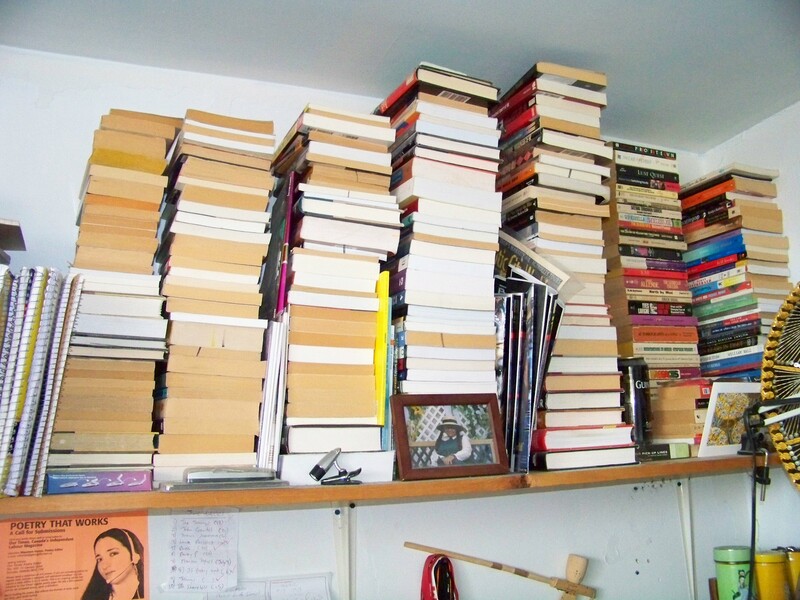 Short story writers barely have collections published. And novelists hope to be the next big writer with the odds literally stacked against them. 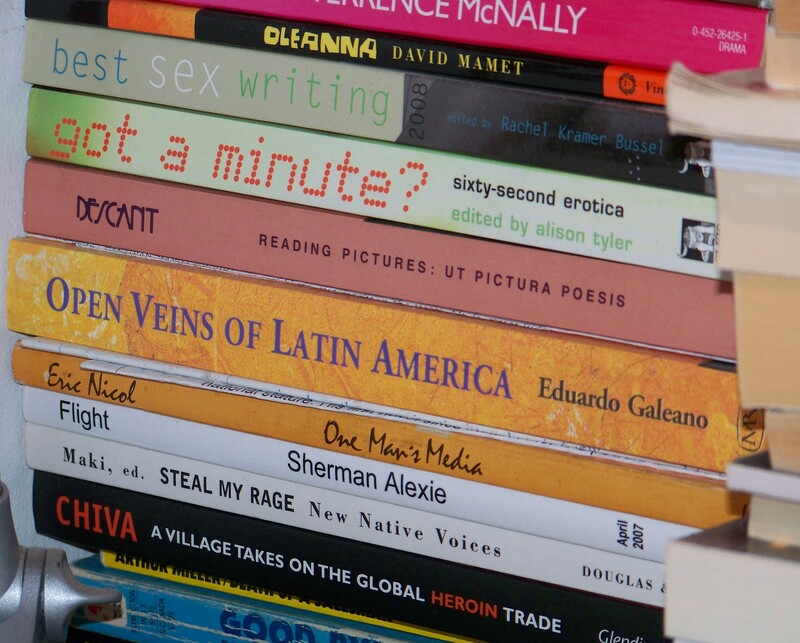 In a country of 300 million, less than 100 writers in the United States live off their writing; writing as in fiction, creative non-fiction, and poetry. I write for two newspapers and I diligently work at this site, posting three days a week: Monday, Wednesday, and Friday. I make no dollars off of this site and freelance gigs are not easy. 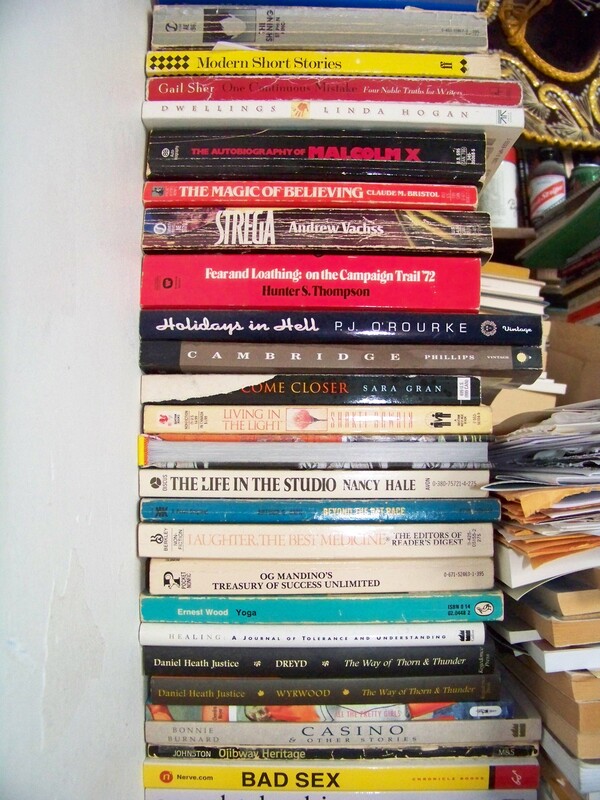 Still, my stacks of books are a reminder of the abundance in my life. I have all I need as a writer: paper, pens, books, a computer, and the will to continually develop my skill. And of course, you, my loyal readers! Books keep coming my way. People are shocked at how I continually find free books on sidewalks, parks, and front lawns. Signs saying “FREE” accompany them and my hands grab them quick. And many of my friends know about my addiction to books so they give me books too. Free books, as well as books I buy in bargain bins at used bookstores, and my local GOODWILL on 50% off day are how the piles keep growing and growing and growing. Some days I feel like I’m in an unwritten Stephen King story where a writer gets swallowed up by his books. Book pages will open and tug at my limbs until they fly off and disappear. Or I’ll be asleep and the books that are on a plank resting on L-frames on the wall above my head will fall one me; bye bye Black Coffee Poet! Or the characters in my many mystery novels will come alive and torture me with none of my neighbours or roommates hearing my screams for help. Maybe I’m turning into a mad solitary writer? I’m sure doctors who’ve sold out to pharmaceutical companies would agree. A psychiatrist would most likely diagnose me as depressed just by viewing my room. Little do they know how happy I am. I’ve loved books since I was a child. My mom introduced me to books as a baby and I never looked back! And I don’t plan too! The love for books and the stacks of books that form in a writers place are something that only a writer, or real reader, can identify with. It’s similar to how a fight fan will never know what it’s like for a fighter in a ring or cage; only fighters know what it is to be facing someone that will fist-fully remind them of their mortality. Only writers and real readers know what it means to want to have books around at all times; what it means to smile when you see words on a page; what it means to buy books when you have tons at home; what it means to enjoy an afternoon at a bookstore; what it means to plan a trip to GOODWILL or the Salvation Army as a weekly routine; what it means to go to certain areas of town where book bins are and have to stop for five minutes; what it means to hold a real book in your hand; what it means to want real pages and ink in front of your eyes; what it means to feel like your are with a friend when alone with a book. At twenty-four, finding myself in retreat in my unheated little basement flat, with not much more than books and a big dog, and all my reflections and assessments about the state of Latinas born in the United States (particularly my own), I turned a sharp focus on writing and women’s literature. …as I fell away from everything and everybody, I moved out of the campus dorms and into a one-room outhouse. . . . My mattress has sunk in the middle. Books, cigarettes, dirty cups, empty chocolate wrappers and magazines are piled around my horizontal torso, on the floor, all within arm’s reach. If I put my mattress back on the bunk I am too close to the light that streams in from the window, so I use the chipboard bunk as a sort of scribble pad of options: butter, a knife, peanut butter and chutney, empty tins of pilchards, bread, a small television set, many books, matches and a sprawl of candles, all in various stages of undress and disintegration. Castillo, Wainaina, and Nason have never been to my home but the four of us know this place of books, pages, pens, paper, computers, reading, writing, and the continual growth of skyscrapers comprised titles that become our living spaces. I have stacks of books, not stacks of cash. I have abundance: friends from the past and present; words; thoughts; intimacy; and stories. I have stacks of books that I am proud of and I don’t want it any other way. 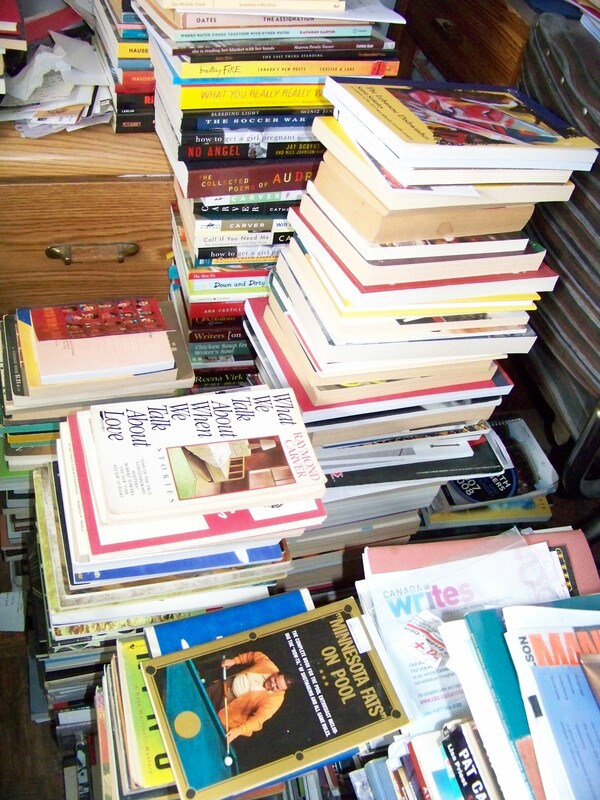 This entry was posted in Uncategorized and tagged "My Stacks of Books" by Jorge Antonio Vallejos, A + E Hoarders, Ana Castillo, Binyavanga Wainaina, Black Coffee Poet, Book Collection, Book Collector, books, Creative Non-Fiction, https://blackcoffeepoet.com/, Jim Nason, Jorge Antonio Vallejos, Memoir, poetry, Short Story, Stephen King. Bookmark the permalink. On reading this one, I became extremely furious, more irate than I’ve been in a while. I see that the number you’ve presented as to the working writer to general public ratio in America is an outright crime against humanity. It is more and more obvious that we live in a society that values mechanization of thought and action over the creative voice. And there is no lack of creative talent, nor lack of abundance in aspiring writers. It is also obvious that especially in such a time it is much needed for all to continue opening our minds to the words which clear the skies of our collective imagination and open pathways to exploration in our daily lives. Where is the activism which speaks to the necessity that we are ever in need of working talent cultivated and creatively explored in the realm of literary art? Where are those unsheathed, unborn voices? When will we live in a society where there is silence enough to hear them and recognition enough to let them keep speaking and humility and patience enough so that we may hear the resolution of novel truths resounding in our minds and hearts on a welcoming, fertile ground for the next voice to begin and carry through its statement unbroken, until finally we may hear our own? Still, we just got to put ped to pad, fingers to keyboard, eyes to the page, and never stop.